Dell pulled back the curtain on its Windows 8 lineup Tuesday, providing pricing and availability for a range of notebooks, tablets and desktops. A total of 10 machines are on the way, with the first four available to purchase now and shipping this week alongside W8 on Oct. 26. The first batch features the XPS One 27 Touch all-in-one desktop starting at $1,599.99 (GB£1,779, AU$1,558) with a 3.2GHz Intel Core i5 CPU, 8GB of RAM and a 1TB hard drive. The non-touch XPS 13, an ultraportable laptop, joins the XPS One 27. It starts at $999.99 (GB£899, AU$973) with a 2.6GHz Intel Core i5 CPU, 4GB of RAM and a 128GB SSD. Dell is also bringing out the S2340T multi-touch monitor for $699.99 (GB£539, AU$680) to turn any Windows 8 desktop into a touch-capable machine. Along with the monitor, Dell will release the TP713 wireless touchpad for $69.99 (GB£49.99, AU$68), offering a multi-touch mouse alternative. 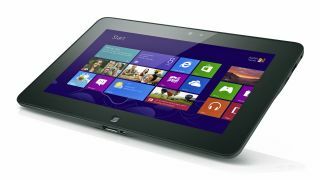 Starting in November, Dell will start shipping out its first Windows 8 tablet, the Latitude 10 featuring full Windows 8 Pro and starting at $649 (GB£619, AU$632). Also arriving in November are the XPS Duo 12 convertible notebook/tablet hybrid starting at $1,199.99 (GB£999, AU$1,169), the 14-inch Latitude 6430u business ultrabook for $899 (about GB£563, AU$875) and the 23-inch OptiPlex 9010 all-in-one touchscreen desktop starting at $1,199 (GB£799, AU$1168). Finally, Dell is bringing out the XPS 10 Windows RT tablet starting at $499 (GB£399, AU$486), and the newly announced Inspiron 15z touchscreen ultrabook starting at $899.99 (GB£879, AU$875). In North America, Dell is already taking orders on its entire Windows 8 lineup, with the second batch of hardware shipping "in the coming days and weeks." U.K. users may have a bit more of a wait for some of those, with Dell saying the XPS 10 and Inspiron 15z will start shipping there in December.